Eight months have passed since I challenged you at the RCGP conference in Liverpool and I think we still have some unfinished business. The elephant in the room is now a stampede. In the time that has passed between then and now, it has become increasingly unpleasant to work as a GP in the UK. This is a real shame; General Practice used to be a really fulfilling job, and on some days, it still is. The majority of my patients are wonderful and providing them with high quality professional medical care is incredibly satisfying. I love that part of my job; I know that I make a very positive difference to the lives of many people. So, what’s the problem you may ask? When did you last visit a GP Mr Hunt, as last time your kids were ill you bypassed the system and took them to A&E. Perhaps this was a publicity stunt to prove a point. The reason I ask is that I and many others have realised that you have absolutely no idea what a GP actually does. I don’t say this lightly, I know you aren’t a stupid man, but the fact that you think that we can be replaced by physicians assistants who will have done a maximum of 82 days training in general practice as part of a 2 year postgraduate course and who even then will be unable to write a prescription makes me wonder? Becoming a GP is the end result of a minimum of 10 years of training. I use every year of that experience to do my job properly. We see people who may have something serious or who may have something minor, but both presenting with the same symptom. Deducing the cause takes knowledge, skill, time and experience, not a computer algorithm. I spent 6 years teaching people how to be GPs too. I have seen very capable clinicians fail at becoming a GP because it requires a very precise and highly tuned set of skills, both clinical and communication based. This simply cannot be achieved in a shorter amount of time, in fact, it probably needs longer training based in General Practice, not in hospital. Instead of valuing this professional expertise, you currently seem hellbent on denigrating it. Not all GPs are going to be perfect, we know that, we are human, but every negative headline suggesting that we don’t know what we are doing, or that we earn too much, or that we don’t work hard enough or don’t diagnose enough of this or that, eats away at public confidence in us and makes patients distrust us. This is leading in turn to an increased number of complaints (in fact, the GMC and ombudsman are encouraging people to complain). This causes a further loss of morale and wastes an inordinate time to answer. Some complaints are justified, sadly more and more are about patients not getting what they want, rather than what they need. This is fuelled by your consumerist approach to the health service. What on earth you are you up to? There is now a petition with more than 100,000 people calling for your resignation. You are attacking consultants, GPs, in fact anyone involved in the delivery of the health service (with the notable exception of your pal Simon Stevens at NHS England). One must ask oneself why. My guess is that it is a well considered plan to set the medical profession up as the scapegoats for the NHS collapsing. You have absolutely no intention of helping it survive. This clearly cannot be seen to be your fault though; that doesn’t make good politics, so why not make it the fault of the GPs trying to run commissioning groups, the consultants or GPs who won’t work 7 days routinely. We aren’t stupid either Mr Hunt. If you were to resign, someone else would simply step in and do exactly what you are doing, because this is the policy your government has decided to implement. Whilst I am a GP, I have worked in hospitals too. I have trained GPs (I resigned because the evil cousin of NHSE, HEE made that job too unpleasant to do too), I work for the local CCG and I am a GP appraiser. I have 2 young children. It would be easier for me not to care about all of this and just plod on and do my job. But I can’t because your actions have made my job almost unbearable. I have the CQC, the GMC, NHSE and the ombusdman all waiting for me to make a mistake and pounce. I have patients coming in ready for a fight because you have raised their expectations and they think I am basically an antibiotic dispensing machine who earns too much and they know better than me (some do, I am not that arrogant). I have watched colleagues flounder and indeed I have had to take time off due to the anxiety all of the above creates. With lovely colleagues around the country we set up ResilientGP to try to educate GPs in sustainable ways of practicing that will enable them to not burn out and to support each other. We have 2726 members as of today and running that forum means we see and hear about the daily struggles and thoughts of those who post. They are frustrated, fed up and many are planning their emigration or retirement as I write this. Why does this matter? It matters because without good quality primary care the population of the UK will suffer. At the moment, thanks to your rhetoric, they don’t really know this. They don’t appreciate that their surgery is probably only one retirement away from shutting, they don’t really understand that the shortage of GPs in the country means that they may not have one soon. This is the inconvenient truth and so instead of having a grown up discussion with the population about using the NHS in a responsible way, you instead make us out to be the incompetent baddies. I could emigrate. My husband is a GP as well and we could be financially better off and probably happier in another country, but we aren’t, because I want to stay here and look after my patients and help General Practice in the UK to survive. We know what you are up to, we know why you are doing it. We ask that your party stops and has a sensible discussion with the professionals who know what is happening at the coalface (not some of the yes men/women who you use to give credence to claims you have consulted the profession). There are ways of fixing this. Lets discuss them. You were too busy to visit a GP practice who invited you to spend some time with them “due to prior commitments” until September. May I politely suggest Mr Hunt, that you and your ill-advised staff shift your priorities and in your words “get real” about the perfect storm you are currently overseeing. How very true. Acute illness can strike at any time, so thank goodness we have the NHS, which incidentally was set up to provide 24/7 emergency care, not 24/7 routine care. I ask you, if someone is acutely unwell, is it unreasonable to allow them a day off to attend a doctor? I’m not entirely sure ‘productivity’ is high on their agenda. Your argument here is that when people are unwell, they should be able to access a doctor; they already can, it’s called the Out of Hours service (OOH) and has been in existence long before the 2004 contract changes. Incidentally, the 2004 contract took away the obligation for GPs to make arrangements for that OOH cover, the cover itself was already in existence and did not change. The OOH service is available for anyone who is ill or needs advice via the national 111 service. Patients can access telephone advice, face to face appointments and visits, 7 days a week, when GP surgeries are closed. The Conservative clamouring for 7/7 opening is to enable a select group of the population to access their routine medical care at weekends and in the evenings. Whilst it may be a wonderful utopia, there is a woeful lack of funding or workforce to enable this pipe dream. General Practice already sees 90% of NHS consultations with only 8.5% of the budget. From a funding perspective, Primary Care provision would need to be increased to at least 11% of the NHS budget in order for this 7/7 opening to occur and this doesn’t take workforce requirements into account. The risible extra non-recurrent funding thus far discussed by the government is a mere sticking plaster to that really required. The normal output of GP training schemes is about 1K per year. If Hunt wishes to increase the workforce by 5K, he needs to double GP training output, every year, for the rest of this parliament. He starts with 30% vacancies and no funding for expansion, a tall order I think you will agree, especially with the hordes of GPs who are already planning to retire early or emigrate because they are sick to death of your type of misleading, inaccurate reporting. In light of your article, I feel compelled to cite the new IPSO standards which state (clause 1a) that articles must be accurate and not misleading and thus ResilientGP demands a print correction and apology to our GP colleagues as per Clause 1b and for it to be given due prominence. GP s across the country have been awaiting the “New Deal” with bated breath…….and scepticism. Because it is a masterpiece in obfuscation and demonstrates the Secretary of State’s mission to ignore the blindingly obvious and push his own agenda against a growing wealth of evidence that it is wrong. GP s are working hard, we are working at the edge of safety and the 2.5K GPs who are part of the Resilient GP on-line group speak of feeling undervalued, over-worked, at constant risk of complaints from an ever more demanding public and picking up the pieces of hospital care being “transferred ” to the community. How is he going to fix this with this “new deal”? He is going to give us data on staffing levels. Oh good, we often wake up at night worried about needing more data. He is offering GP trainees an extra year IN HOSPITAL training posts. An extra year in GP placements would be great. It would help people to pass exams first time which would improve morale as a result and enable GP s to hit the ground running when they qualify. The RCGP and those doing the training on the ground have wanted this for a while, but Mr Hunt has increased the length of hospital training, for GPs. He wants us to work 7 days per week. This is despite growing evidence that 7 day working isn’t necessary. Many areas are ending their Sunday surgeries due to lack of demand. The complex elderly patients need and value continuity of care, 7 day opening will spread us more thinly during the week. This is precisely what will damage their care. He is going to give us 10,000 more primary care staff. Presumably they are currently growing on the same tree as the 5000 GP s he has been promising for ages. GP practices wont be able to afford to employ them currently without more funding, even if they did exist. 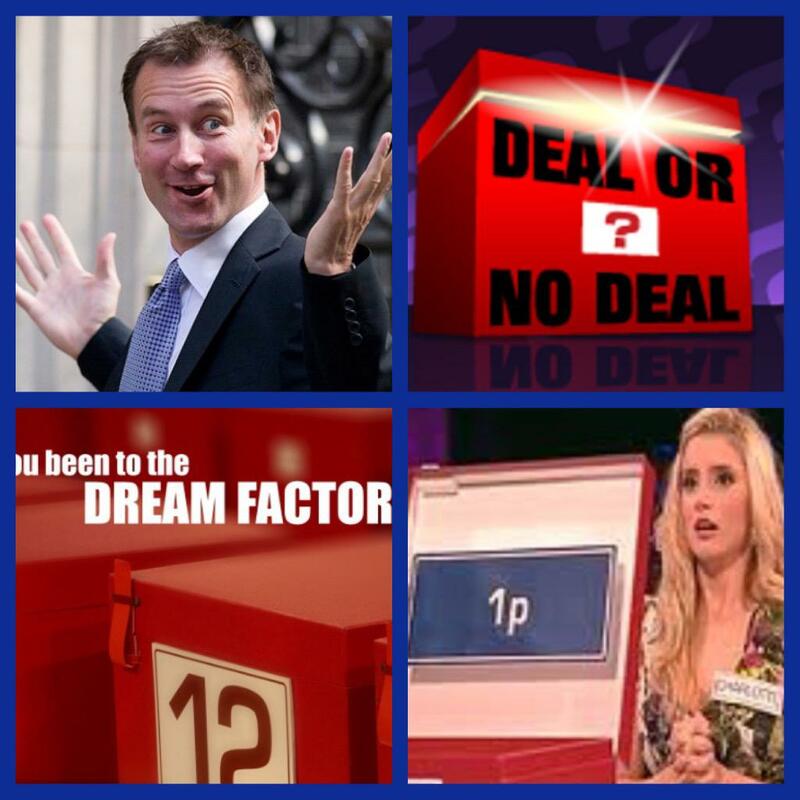 Our response to Mr Hunt then……….So far Mr Hunt, your New Deal isn’t really cutting it. We like the efforts to encourage new doctors to join General Practice and helping people return to work is great, please make that happen FAST. What would we have liked to have heard you say? Encourage the public to use General Practice responsibly. You understand and value the good value care we provide. Therefore, you will stop denigrating us in the press and encourage the public to value us and use our services in a wise and sensible way. In fact, you will start some public information campaigns to ensure people understand the cost of the service and what it is reasonable to ask the NHS and GP s to do. General Practitioners are very good at spending money efficiently for the good of their patients. Therefore, you will stop incentivising us to work through dozens of piecemeal programmes that often require more administration time and data collection than their improvement of patient care could ever hope to achieve, You will, instead, increase the global sum and allow us to set up high quality services that work well for our individual patient populations. You understand that GP s are being asked to commission and design new services and work differently. The recent Nuffield Trust report said one of the biggest barriers to this is the huge clinical workload preventing GP s from being able to take time for this. So agree for funded time for us to meet and plan, getting good quality locum cover for our patients. There could be one problem with this plan however, despite more people becoming locums, it is hard to get one. CQC visit preparation, constant data feedback to NHSE local teams to justify payments for schemes, poorly thought out schemes like the unplanned admission programme…..all of these take hours of time for ourselves and our admin team. Time we could be spent caring for patients or planning new services. Listen to us and take the time to get NHSE, HEE and CQC to massively reduce the bureaucratic burden they place on practices. This New Deal, may well turn out to be the final deal for some GP s who now decide to retire or emigrate as there has been nothing new offered. What a wasted opportunity. We will continue to support each other and aim to protect the future of high quality general practice. But we won’t sit back and let you desecrate one of the best primary care systems in the world due to ignorance of what we do and how we do it. Rearranging the deck chairs is getting us nowhere Mr Hunt. Both the RCGP (3) and BMA (4) responses are available. In response we feel the following points need to be made and clarified. 7-day access to GPs currently exists and is functioning in the form of current out of hours (OOH) service. Moving to an 8am-8pm 7-day a week ROUTINE GP service from current 8am-6.30pm provision would amount to 60% increase in current work provision. The Government has ALREADY pledged to commit at least £8 billion funds (by 2020) in addition to £22 billion efficiency savings to make the CURRENT £30 billion shortfall in NHS (not primary care) funding. This has been commented by NHS England chief Simon Stevens as money needed just to keep the NHS running rather than funds to expand services. These plans would make the NHS budget ~£86 billion – a reduction in actual funding. The planned increase of 5,000 GPs (if an increase from current GP numbers) would lead to only a ~13.5% increase in GP workforce (over the next five years) which are being asked to provide a 60% increase in work provision with an overall reduction in funding. Simply the numbers do not add up. Neither the ‘new deal’ or where 5,000 GPs will be sourced from has been detailed and without this information both politicians are simply creating sound bites which are being pushed to create headlines with no substance. Today, my wife and I locked ourselves out of the house. Silly mistake; we left the key in the wrong side of the door, and it shut behind us. So, following a rather poorly conceived attempt to fish the key out the lock with a bit of stout wire, I called a locksmith. He turned up three quarters of an hour later, put a gadget through the letter box, and opened the door. It took him about three seconds, and he charged us £60. I thought that was fair enough. I left the house and went to do a home visit of my own; a rewarding one, which involved some chronic disease management, a bit of social care, and an incidental check on a spouse. The care I give that patient – and which I am delighted to give, and which I enjoy giving – encompassed eleven visits since Christmas, alongside correspondence, test results, working with consultants and district nurse colleagues, meeting with a social worker and also involved two other GPs here, our admin team and our nurse. Her care for an entire year from our practice costs the NHS about twice what the locksmith charged me. Primary care is a good deal for the NHS, and a good deal for the patients we look after. This election, look past the empty soundbites, and the policitcal grandstanding, and ask yourself whether you feel that it’s going to be in good hands come May. I don’t want much, I am your GP. I want enough appointments, I am your GP. I want longer appointments, I am your GP. I want to feel that I can focus on the patient in front of me, without dreading the crushing workload waiting when they leave, I am your GP. I want to smile and look up expectantly when someone knocks/calls/stops me in reception to ask me something, I am your GP. I want to concentrate on personalised family medicine, I am your GP. I want to see you when you are unwell with medical needs that I can help, I am your GP. I want to feel optimistic on my way to work, knowing today my referrals will be read, my patients cared for in hospital and their concerns listened to in outpatients, I am your GP. I am your GP, I cannot replace your sister, father or mother for sensible advice. I am your GP, I have no legal qualifications. I am your GP, I have nothing to do with housing, immigration or your ability to get into the school of your choice. I am your GP, I know nothing of ‘mould’ in your bedroom, or heating or double glazing. I am your GP, I have no idea how to manage your bullying boss, demanding mother in law and uncaring partner. I am your GP but I cannot provide all medical services alone, unsupported, at the beck and call of patients, relatives, nurses, reception staff, carers, consultants or nurse specialists. I am your GP and I am expected to respond to all and do all that is asked – even if I have no appropriate training, funding or experience. And if I refuse, I am made to feel that I am failing my patient. I am your GP and know that pharmacists know more about medicines, physios know more about musculoskeletal pain, and psychologists know more about managing your dysfunctional thoughts. I also know seeing other professionals will inevitably cost you money. I am your GP and seeing me is free. To my patients, their relatives, local professionals and colleagues in both the community and hospital environment….. If you are asking ‘the GP’ to do something, have you really considered whether it is essential, or is there an alternative? If things do not change have you considered you are driving us to extinction? Have you considered life without GPs? I think you will wish someone told you sooner…. I am writing from the bedroom of my parent’s house, having arrived here late at night. I wish it was in pleasant circumstances, but sadly my mother has just died, at 69. A life cut short, a husband bereaved, a son without a mother. Today I join the ranks of those who have been let down by the NHS, the professional leaders and academics, the government, but also a community of Britons. I’m breaching her confidentiality, because I know she would want lessons to be learned from her death. Some will simply decry this as grief speaking, but if we cannot express our frustrations in grief, then I fail to understand where our compassion comes from. My mum died of biliary sepsis and hepatic encephalopathy after a month in a coma, on and off ITU. The care she received by the doctors, nurses and other workers was exemplary, both in primary care and hospital. I have nothing but admiration for them. But all are overworked, underresourced, and this was as preventable a death as I’ve ever seen. My mum became generally unwell a few days before my dad found her in a coma. Being a working class miners’ family, who grew up in a spirit of solidarity and community support, and taking only what they really needed from the state, thy did not want to bother her GP. A day before she was admitted to hospital, they tried to get her an appointment with the GP, but not knowing how to press the buttons ahead of those more savvy consumers well trained in claiming emergency need for their complaints to get what they wanted (as a patient said to a colleague, ‘Well doctor, it might not have been an emergency for the NHS, but it was to me’), there were no appointments available until the next week. She retired to bed and never properly woke up again. I am a GP. But I’m not the usual kind. I am solid working class in attitude, speak like it, would not be described as posh in anyway, believe in a strong welfare state, and grew up as a child through a year long miners’ strike during which I ate at soup kitchens. I lived in a community on our street (I grew up on the street where Billy Elliot lived in the film) where families supported and relied on each other, where help was provided with the sick and, the needy, and the doctor and state bothered less for the chronic illness that is prevalent in that community than should have been the case. I grew up with people who valued the founding principles of the 1945 compact to use the precious resource of the Welfare State responsibly, many having sacrificed sons, brothers and fathers in a war to create a better place for us. But that community is gone, destroyed by ‘progress’. I have watched as the NHS I loved has been decimated, packaged for sell off, and consumerised by a succession of governments, Labour, Tory and Coalition alike, who claim to be ‘supporters’ but have done everything to destabilise the system to breaking point. I’ve watched as our medical leaders have colluded with this, sometimes for their own political or career gains, at the expense of patients and colleagues. I’ve seen academics push self-serving agendas that are unrealistic, claiming those at the front line need to do more without any additional resources or genuine understanding of the reality of the situation. As a former postdoctoral scientist and public health researcher who worked tirelessly to get the smoking ban enforced, I’m ashamed by the behaviour of some of them who tell overworked front line staff how to do better from the comfort of a computer desk and SPSS spreadsheet. Good officers lead from the front, and check their men’s feet before asking them to march into battle. Many have forgotten to do that. Others never understood such principles in the first place. My ResilientGP colleagues were recently criticised for daring to raise these issues. Some argued that we were all right wing, and simply didn’t care about our patients. I and the rest of the ResilientGP team are hugely insulted by that sweeping assumption. I’ve given my life to patients who needed me, been there round the clock for them, and still intend to be in the NHS until I retire. The suggestion that inappropriate demand has become the focus of what ResilientGP is about is incredibly incorrect. We acknowledge it exists, and for once I agree with Dr Clare Gerada – in not blaming patients – but this is a factor, one of many, that needs debate. Explaining not blaming was our aim, and that is what we intend to do. Some may not like the methods, but I challenge them to find the methods to do so if they have the expertise, resource and academic freedom to do so, not pretend the problem does not exist. We all know it does – just some of us are prepared to put our heads into the shooting gallery to raise the issue. ResilientGP is campaigning for a health service where we have the resources to do the job, safely and in a timely manner, for patients who need our care. The big reasons we cannot do this are the dismantling of the social contract between state and community, chronic underfunding, power brokers in the medical elite and government who have colluded to deliver their own agenda for their own gains, and not for patients. Many patients are scared and clueless where to turn, given that any ‘community’ beyond a daytime talk show really no longer exists for many. We do not have the capacity to meet all ‘wants’ anymore, and as much as I would like to, I have to be realistic in that I can only give so much of my time in a finite system to those who are ill and whom I can help influence their health. Give me the resources to do more, and I will. But I haven’t right now, and to pretend otherwise is to collude with those who have created the problem. By standing up and shouting ‘enough’ we are raising the problem and throwing the gauntlet at those who have created the problem in the first place, and that is NOT patients. My mum died, too young, due to an uncaring government, a medico-political elite who debate in committees but have rarely experienced poverty themselves as I have, and yet profess to understand it better than I do, and a community who have not had to make sacrifices and no longer understand that a precious resource like the NHS should be used carefully, responsibly and should be cherished. I hope that ResilientGP can work with others in both government, academia, Royal Colleges and the BMA to change the situation. My lifelong work in research, teaching and clinical practice has been dedicated to serving my patients, and trying to rebuild a community that has been lost, so it is resilient enough to fend for itself in days of need. I now dedicate my efforts in ResilientGP to my mum, so that she would be proud once again of an NHS able to respond and care when needed. She was proud of me becoming a doctor, and said ‘go get em son’. I won’t rest until we get a service for our patients that we can be proud of, despite whatever opposition is thrown at my colleagues and me. The battle is too vital not to win. Rest In Peace Catherine Woodall (1945-2015), from a loving son and husband. BMJ Blog via @bmj_latest: How general do we want general practice to be? Do GPs and their availability exist for those without medical need? Do they exist for those without medical need, in the hope that a brief interaction will contribute positively to an episode of theoretical future care? If I am unhappy with my own GP I can take a number of actions. I can complain to the practice manager of my surgery, I can complete a friends and family test, anonymously as well as leaving messages on the NHS Choices website, again anonymously. I can also use social media to talk about my GP, call a newspaper or even lodge a complaint with General Medical Council. One of my own patients has written directly to the Parliamentary Ombudsmen and brings in the acknowledgement slip with her each time she comes in. That I can’t reveal anything more about her, in an effort to protect her confidentiality illustrates the issues that doctors, including GPs, have in talking about the minority of patients that make their life and work a struggle at times. Reported case studies need patient permission and many bloggers who write in the medical press change the details of patients that are rude, inappropriate or simply daft, in order to protect their identity. When it comes to the issue of trying to provoke debate about what some patients actually come to the GP about, this issue makes it very hard to know what to do. It seems that GPs are to “See no evil, hear no evil and speak no evil (of)” their patients. The customer, sorry patient, is always right and according to the health secretary knows better than the doctor. How can you compile a record of how the GP system in the UK is, albeit in some cases inadvertently, abused by patients. Resilent GP debated the posting of the “inappropriate use of GP appointments” survey report. After being posted on the website, it was withdrawn after concerns about whether patients’ confidentiality was being breached. Careful reading of the report will show that this is not the case. It was restored so that healthy debate can continue. The Resilient GP partners have stated publicly that they feel that it is not unethical to raise real life examples of inappropriate appointment use. This is done by the ambulance service.. Although there are concerns that there is no fixed definition of an inappropriate consultation and that “naming and shaming” such inappropriate uses will discourage patients from attending their GP with vague symptoms that could belie some serious cause, I would argue that we don’t seriously think that speaking to your GP about the colour of the fluff you find in your belly button (true story) or any of the “symptoms” listed in the survey could result in a medical diagnosis other than health anxiety. Furthermore, by educating patients not to use up appointments with such things we may actually improve access for those that actually need it, for their serious, even life threatening conditions. Therefore, in order to improve access for patients in need, we need to first identify and discuss the problem of inappropriate GP appointment use, then decide how this problem should be tackled by the general practice, public health authorities and society as a whole. We feel that is is not unethical to raise real life examples of inappropriate appointment use. No one has identified any patient and sharing information on the misuse of resources and opportunity cost involved denying someone else more in need of an appointment is both worthy, ethical and necessary. The ethics of utilitarianism are equally important here and it is a duty of doctors to challenge inappropriate use of resources. It is, to us, highly unethical that the leaders of the profession have done nothing to challenge this elephant in the room. We understand some might feel uncomfortable, but these are examples happening every day in the NHS, which occur solely because we are free at the point of use. The public have a duty to use services responsibly, or be educated in where they are not. The problem is now we are so overregulated and time stretched that for a doctor to challenge such use simply invites a complaint which then takes hours to respond to, so many NHS staff lack the courage or resilience to challenge. So we have to be brave, as a group of healthcare workers desperate to improve access for patients in need, and stand up to defend the NHS, profession and other patients who cannot access healthcare by raising this vitally important issue.